Digital signage provides powerful POS advertising, making it ideal for the QSR industry. A digital menu board or promotion board provides easy updating of menu choices, prices and daily specials. Content can be dynamically scheduled, allowing for rotating menus and specials based on time of day, day of the week, or season. Vivid animated displays encourage purchase of featured items and allow restaurants to target their marketing to best suit their business and clientele. 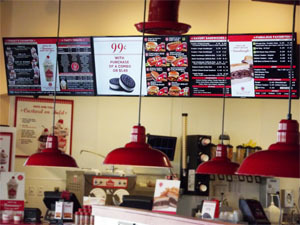 Axon Displays has worked closely with a number of restaurant owners and franchises in developing digital menu displays. Our solutions include all of the hardware and software required, as well as content development when needed. Check out the PDF below for a great infographic depicting some of the statistics and successes of digital menus, including ROI and Sales Lift data.